O.B Amponsah, a medical practitioner is hosting Easter Saturday's comedy show live. Comedian Warris will make his first appearance on the show, alongside Hogan. 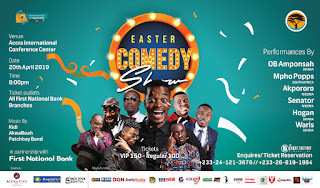 This holiday, Easter Comedy 2019 show is also bringing to the AICC in Accra, Nigeria's top comedians Akpororo, Senator and Mpho Popps from South Africa who have vowed to leave audience in stitches by delivering hilarious comic punches from all aspects of life. Being the unconventional humor cracker he is, AKPORORO, one of the funniest man on the continent has expressed his excitement to be coming back to perform for his Ghanaian fans. " I miss my Ghana people and I want to tell all of them to meet me at the venue on Saturday April 20 for the laugh of their lives. This time I want to meet fans and interact with them as well so everybody should get the tickets and come" - Akpororo assured. According to spokesperson for organisers - Event Factory, Ethan Lawrence, this edition will pair GH performers with their Naija-SA counterparts to create fun-filled atmosphere for families, friends and networking. "We cannot overemphasize the essential space Easter Comedy show occupies in the psychologically well-being of patrons through various doses of stress-killer jokes and humorous presentation by only the best comedians the continent has to offer"
"The show equally plays a vital role in sustaining the creative sector" — Ethan said. 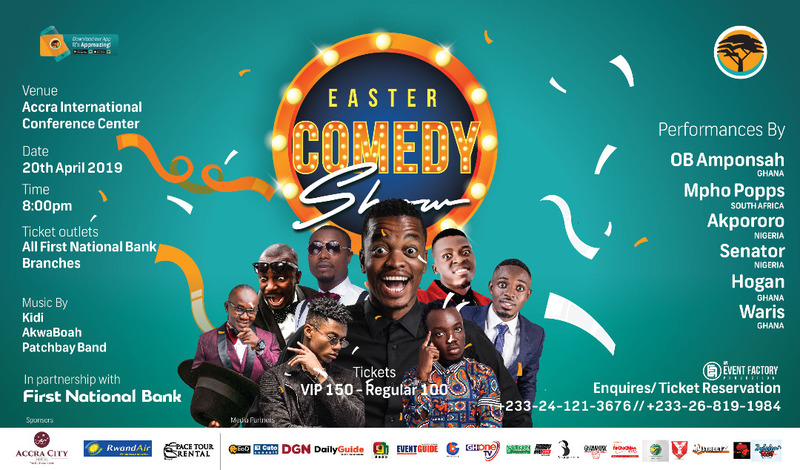 After six years of phenomenal performances, Easter Comedy with the support of First National Bank, RwandAir, PaceTour Car Rentals, Accra City Hotel and other partners is back! From the award-winning event producers, Event Factory, this year's edition is bringing to Ghana Africa's finest humor artistes from Nigeria, South Africa and Ghana. What's more, patrons will have a great networking time as they are treated to great live music performances from KiDi and Akwaboah. Easter Comedy is carved to be suitable for all members of average family. "Comedy shows are not only for mothers and father's or grannies — it's universal and a recommended therapy for young people" "This year, we want to get more younger people to come to the show. That's why we have a top performer like Mpho Popps, a guy who use rap to tell jokes to young people" — Nabil Alhassan, CEO of Event Factory. Mpho “Popps” Modikoane is a South African comic with his own comedy special launched in 2018. His main line of work is comedy and organizing empowerment workshops for kids from the townships, encouraging them to dream big and make “no excuses.” He also creates really cool edutainment films. He has shared stage with top comedians in Johannesburg. He was famously known for competing in the sixth season of the SABC3 reality competition Strictly Come Dancing, in 2013. Tickets are out and selling at 100 cedis regular and 150 cedis VIP at all First National Bank branches across the country. Easter Comedy is an annual comedy and music night that takes place during Easter holidays in Accra, Ghana. It is organized by Event Factory Ltd and has hosted comedians from all over Africa. The next event will take place on April 20, 2019.